A stunning, well equipped self-catering apartment which sleeps 4, directly on the beach. Just a minute walk and you are on a beautiful beach at the confluence of the Umzumbe River. One kilometre away is the Blue Flag beach of Umzumbe, with shark nets and life guards. Fishing, surfing, wind surfing or simply relaxing and exploring the rock pools of the warm Indian ocean - right on your doorstep - you choose! Ideal holiday! The Unit is also equipped with a Solar Dome, which is a remarkable tool to cook a wide variety of food with. This is a delightful 2 Bed en-suit, open plan apartment. Each bedroom has a Queen size bed. 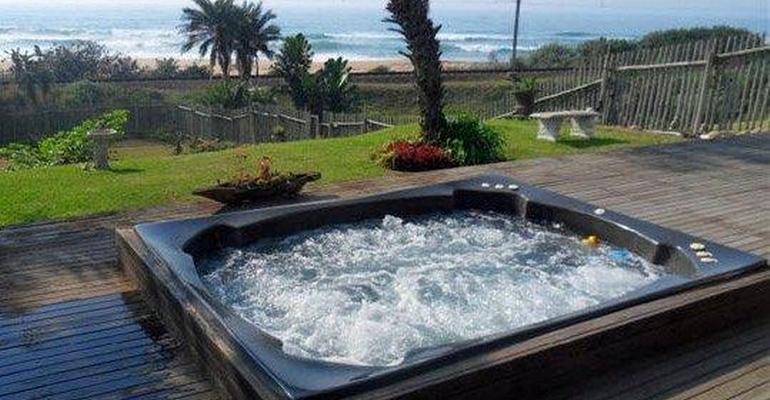 Two Jacuzzis on open deck with breaker views for private use. Linen, bath and hand towels are supplied. Beach towels NOT supplied. Pet Friendly - Small socialised dogs welcome by prior arrangement. Strictly no smoking in the Apartment or Wooden Deck.